Edinburgh Monarchs defied the odds to book their place in the Championship KO Cup quarter-finals with a nail biting 46-43 win over Glasgow Tigers in their second leg tie at Ashfield Stadium yesterday. Many people thought Monarchs’ two point first-leg lead gained at Armadale would not be good enough. How wrong they were. Monarchs, who lost American Max Ruml after his first ride, shocked the Tigers with a battling display to go through on aggregate 92-87 and a last-eight clash against Berwick Bandits. Jubilant Monarchs promoter John Campbell said: “We rode very very well and the main difference on this occasion was that Erik Riss won vital races for us. “We built up momentum in the second half and it became obvious we could win. Monarchs shared the opening heat when Ricky Wells defeated Chris Harris and Lewis Kerr. But Wells’ team-mate, Joel Andersson, trailed in last and this is Monarchs’ problem right now – too little support for the heat leaders. And the second heat proved to be a real disaster for Monarchs when Coty Garcia retired then partner Josh Pickering fell and was excluded. This gifted a 5-0 verdict to Tigers reserves James Sarjeant and Jack Thomas. The Tigers led 8-3 and were already ahead on aggregate 52-49. The home side stretched their lead even further in the third race, Claus Vissing taking the chequered flag. Mark Riss claimed second place for Monarchs, but Paul Starke snared a third-place point at the expense of Ruml, and this 4-2 pushed Tigers further in front 12-5. Ruml hit the fourth bend fence and ended up lying in a heap at the starting gate. He said he was fine but was put in the track ambulance by medical staff to be assessed. The Californian then withdrew from the meeting and was taken to hospital for a precautionary check-up. The Tigers were controlling the meeting and earned another 4-2 in the fourth race when No.1 Richie Worrall headed home Monarchs skipper Erik Riss. Wells won his second race of the day for Monarchs in the next heat but once again Andersson could do no better than finish fourth. The Tigers now led 19-10 and looked comfortable without having to ride like world beaters, which they are not. Another Tigers 4-2 in the seventh heath seemingly hastened their march to the next round as they opened up a 26-15 lead. Monarchs were battling on but a lack of race winners was heir undoing – and not for the first time. But an unexpected 5-1 in heat eight gave Monarchs a chink of hope. 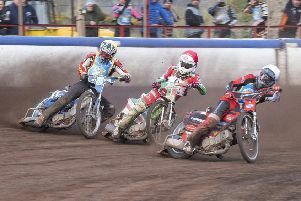 Pickering and Andersson amazingly got the better of Tigers No.2 Kerr and, with Sarjeant retiring from the race, Monarchs closed the gap to seven points, 27-20. Pickering was only Monarchs’ third race winner of the afternoon. And Monarchs continued their comeback in heat nine when Erik Riss claimed his first victory in three outings with Garcia picking up a point for a 4-2 which closed the gap to just five points, 29-24 – Monarchs now only three points adrift on aggregate. Game on. However, the Tigers steadied the ship with a timely 4-2 in the 11th race to calm their nervy supporters. Heat 11 was shared and was won by Monarchs ace Wells for his third victory of the match. Vissing ran wide in heat 12 causing Mark Riss to come down on the first bend. All four were called back for the rerun and Vissing did exactly same but was somehow allowed back in for the second rerun which Mark Riss justifiably won, and with Pickering getting third this 4-2 inched Monarchs closer to their rivals once more. Erik Riss and Wells pulled off a sensational 5-1 over Worrall and Harris, who fell, and this put Monarchs behind on the day 39-38 but crucially one point in front on aggregate 84-83. Monarchs were on a 5-1 in heat 14 with Garcia winning the race, but Pickering’s bike slowed to a stop allowing his Tigers rivals through for a share of the spoils. It was all on the final heat now. Monarchs finished in grandstand fashion with a golden 5-1 from Wells, who completed a paid 15-point maximum, and Erik Riss, to give them an astonishing triumph. The Tigers will be stunned at Monarchs’ comeback but, in truth, they carried too many passengers. Glasgow: Vissing 10, Worrall 9, Harris 7, Thomas 6, Kerr 4, Starke 4, Sarjeant 3. Monarchs: Wells 14, E Riss 12, M. Riss 7, Pickering 6, Garcia 3, Andersson 2, Ruml 0.